The problem of avoiding dangerous climate change requires analysis from many disciplines. Mainstream economic thinking about the problem has shifted with the Stern Review from a single-discipline focus on cost-benefit analysis to a new inter-disciplinary and multi-disciplinary risk analysis, already evident in the IPCC Third Assessment Report. This shift is more evidence of the failure of the traditional, equilibrium approach in general to provide an adequate understanding of observed behaviour, either at the micro or macro scale. The economics of the Stern Review has been accepted by governments and the public as mainstream economic thinking on climate change, when in some critical respects it represents a radical departure from the traditional treatment. The conclusions regarding economic policy for climate change have shifted from “do little, later” to “take strong action urgently, before it is too late”. 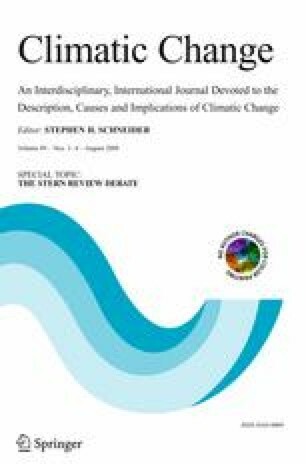 This editorial sets out four issues of critical importance to the new conclusions about avoiding dangerous climate change, each of which have been either ignored by the traditional literature or treated in a misleading way that discounts the insights from other disciplines: the complexity of the global energy-economy system (including the poverty and sustainability aspects of development), the ethics of intergenerational equity, the understanding from engineering and history about path dependence and induced technological change, and finally the politics of climate policy.